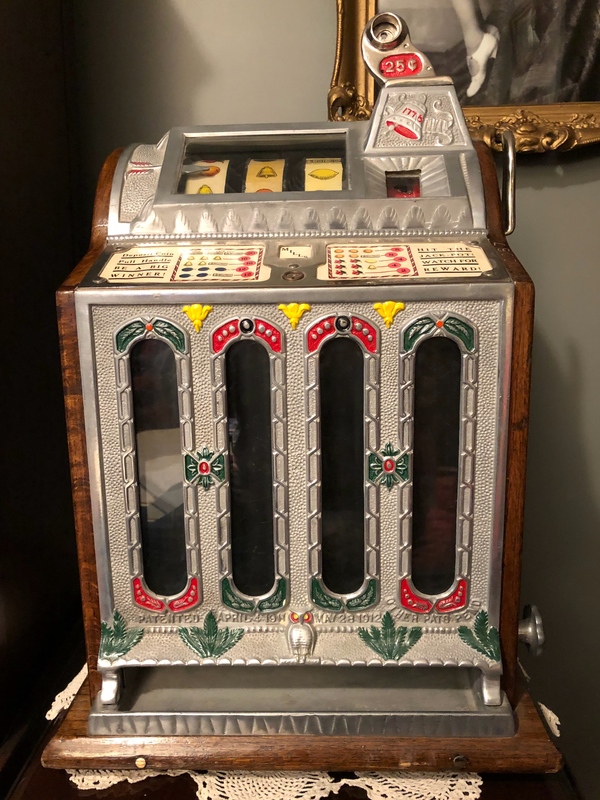 I've been lusting after a vintage slot machine from the 1920's or 30's for years and today I pulled the trigger at an estate sale. I'm excited about my new purchase, and I want to learn all I can about it. I figure the first thing I should learn about it is if it is authentic. 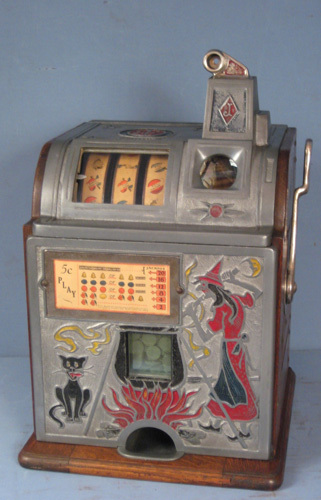 I have researched a bit on how to identify fake machines, but I'm no expert. I went with my instinct and bought. My window of opportunity was short. I'm hoping I made the right choice. The seller did not have a lot of information about the machine. It was owned by a former St Louis Cardinals player and contains a sticker inside from St Louis Slot Machine. From what I could determine, I believe it to be a mid to late 1920's Mills 4 Column Front OK Mint Vender, 25 cents. The denomination worries me a little, but based on a manual that I found on eBay, I believe this machine was available as a 25 cent machine. Any examples I can find of similar machines are 5 cents. Please tell me anything that might help me determine authenticity and the correct name and manufacture date if you can. I'll be happy to answer any questions or provide more photos if it helps. Thanks! Nice find looks original restored some time ago. Sorry , but no 25ç for this machine, only 5ç. Good point , the front lock is the original ! Missing , the Dial and the future pay . Check at this address (sorry it s in French) ,a lot of information ! And here for a little Gem !!! manufacturers would build what ever an operator wanted. i have in the pat had several FOK with quarter play, and, they did have the future pay dial on the front of the mechanism. i have one now that i am currently restoring. i had in the seventies a 10 cent Rockola war eagle, which is a converted silent FOK. no other coin other than a dime would fit through the coin entry. that machine was stolen from me during a break-in at our home on February 20, 1980.
machine had been pictured and documented in the coin slot magazine. i have included here pictures of the award card from the 25 cent FOK i am currently restoring. Thanks for all the info so far! I'm glad to hear that it's at least mostly authentic. That makes be pretty comfortable with the price I paid. The top edge of the side panel has a number etched in it... 102067. I'm guessing that's the serial number? Is there some kind of serial number registry? I'll try to take a bunch more photos and get them posted here soon. That’s a nice machine. Looks clean what did it cost you? Okay, I took some more photos and uploaded them here: https://imgur.com/a/iwchkg7. Please have a look and keep the great info coming! gsx11r: Thanks for the links! I just finished checking out the "gem". That's fantastic! I need to find an original copy. Will check out the other links soon. 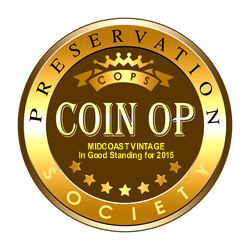 Midcoast Vintage: Thanks for clarifying that 25 cents was a possible denomination. I hope maybe you'll be able to tell if the 25 cent on mine is original. Please check out the photo album linked above. dhw3: Thanks! They had a $2000 US price tag on it. I ended up getting it for a little less than half that. After reflection, I agree with you Midcoast Vintage ! When you check the parts list , you can find some parts available in 5/10/25/50 and EP . But Nothing in 1ç !!??? But it s the first time that I see one in 25ç, exept for the Fok from Europe ! SnootyDrinkingRoom , the FOK look to be in good condition. -The Mech seem to be the good version for this model and this year(1923/24/25 ). Not a mech from 1930 and after ! -The wood case seem to be original. -The back door is the good version for this model and have a Mills lock like the one on front. -The price seem to be a little High for me but not crazy , correct price for a FOK in good condition and a good restauration. Give us some news if you buy it ! gsx11r: Thanks for the additional info. I'm happy to hear that the machine is mostly original. To be clear, when I posted I had already bought the machine. It was at an Estate Sale and I had a limited time to act, so I checked it out as best I could with my limited knowledge and took a chance. The asking price was $2000 US, but that's not what I paid. I negotiated a price of $950 US. I don't want to stray from the topic too far, but I do have more questions. Could I PM you with a couple more questions? Thanks! Very good price . Congratulation. And sure, you can PM me. But your problems and reply can help someone on the forum , so you can post also your question here "in the good section".